We've been hard at work fixing bugs since the Godot 3.1 beta 2 last week, and our new beta 3 snapshot is a lot closer to what we want the final 3.1 to be like. There were over 600 bugs listed for the 3.1 milestone at the start of the month, but we've been reviewed them tirelessly over the last few weeks, and many of them have been fixed, or postponed to the next milestone when they were not critical. The GLES2 backend is getting more and more mature, especially for the web and mobile platforms where severe issues have been fixed. See the changes between 3.1 beta 2 and 3.1 beta 3. This beta is built from commit a851033. Contrarily to our 3.0.x maintenance releases, which include only thoroughly reviewed and backwards-compatible bug fixes, the 3.1 version includes all the new features (and subsequent bugs!) merged in the master branch since January 2018, and especially all those showcased on our past devblogs. It's been almost a year since the 3.0 release and over 6,000 commits, so expect a lot of nice things in the final 3.1 version! Documentation writers are hard at work to catch up with the new features, and the latest branch should already include details on many of the new 3.1 features. Juan added several tutorials on new 3.1 features this month (2D meshes, 2D skeletons and AnimationTree docs). 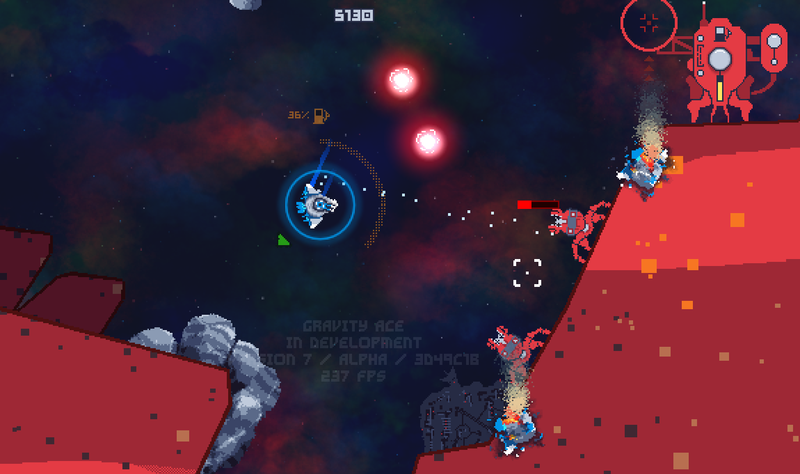 The illustration picture is a screenshot from John Watson's upcoming game, Gravity Ace, a gorgeous arcade twin-stick shooter currently in public alpha on itch.io.